Mobile phones are no more a luxury but a necessity in today’s day and age. This fact is well understood my Micromax unlike any other mobile phone company. Micromax is perhaps the only Indian mobile company that is constantly launching upgraded mobile phone at very good price that its peers can only envy. It has created a scenario where it’s the buyers market now. Giving the buyer wider choice in mobile phones at an affordable price and mind you without compromising on the technology. The new Micromax X456 is one such mobile phone ready to give tough completion to its contemporaries in terms of style, price and technology. Lets us read on and find out more. Solid in make without giving away the style is the new Micromax X456. The first look can pop number of questions in your mind. First of all would be how could a piece so attractive that can give any high end mobile phone run for its money be so attractive yet cost you only Rs. 2690/-? 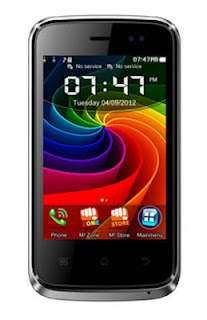 Yes its true the new Micromax X456 price is only Rs. 2690/- all inclusive. Do not be apprehensive about its features as they are up to international standards by all means. One of the first things that could grab your attention would be the 3.5 inch TFT touch screen that is incorporated with 65536 colors. Smooth to operate yet not over sensitive. This is a dual SIM phone that supports GSM too. It comes along with a 0.3 MP primary camera that enable you to click some picturesque photos. It supports zoom, night vision, multi vision and brightness. The battery has a capacity of 950 mAh that can give you a talk time of 180 minutes and 250 hours on standby. The new Micromax X456 comes with internal memory of 64 MB with an expandable memory of 8GB with micro SD slot. Multimedia features like the Music, video player and Radio are also present in this phone. It supports internet features like Bluetooth, email and GPRS too. It has multiple language support functions. It supports English as well as Hindi language hence if you are not comfortable with English language on your phone you can also switch to Hindi for better understanding of the features. Other important features like MMS, Audio recording, web cam interface, incoming call guard are also available on this phone. Surprise feature like the M Store, ebook, and M zone is also featured for addressing all your needs. With all these world features available at your finger tips the Micromax X456 is a surely a winner as peoples mobile phone as it has addressed to all the requirements of people at an extremely affordable price. Micromax X456 review is also positive giving an opportunity to the common man to switch to touch phones that would otherwise be a distant dream. There is no more time to waste before Micromax decides to shoot the prices up, it's time to just grab it from the nearest retail or online store. Author Bio: Monty Alexander is a well known author and has written articles on Micromax X456 Price and many other subjects.